As the choir soared at the end of the service there wasn't a dry eye in the place. Well, maybe there was one. Or a pair to be precise. Belonging to Bruce. The dry eyes were replaced by a wry crinkle at the corner of his mouth. He, and the sizeable congregation, were here today to bury his twin brother Avery. But Bruce didn't share other people's sorrow. Though he wasn't happy so much as relieved. All his life Bruce had been beaten. Beaten by Avery. While both boys might be described as athletic Avery always won. It started when they were kids playing in the backyard. Avery was always fastest. Bruce actually thought it began when they were born. Avery was born first followed by Bruce and that had set them on their way for the rest of their lives. They competed in athletic events at school. Avery was the fastest football receiver. The fastest soccer striker. The fastest baseball runner. The fastest 100 yard dasher. And so on. Bruce tried to beat his brother but to no avail. Avery came out on top every time. Until last week. The two were competing in a marathon through the downtown streets when Avery, out in front as always was fatally struck by a city bus which had mistakenly wandered onto the marathon course. He was the first marathoner to be struck by a bus. Another first. And so these events, these competitions where the athletic Avery always came first ran through his brother's mind. And as the coffin bearing his brother Avery in his rakish red running suit preceded the procession into the family ossuary Bruce swore to himself that Avery now came first in the vault. 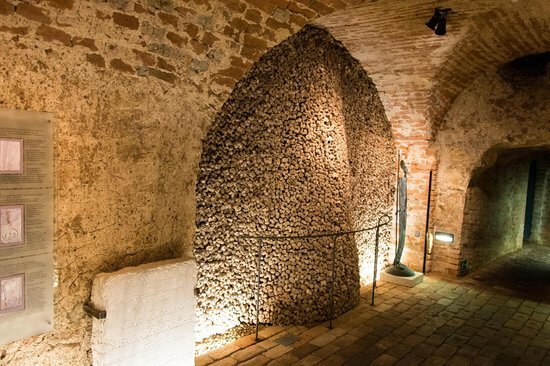 The prompt from Studio30+ this week is ossuary/vault.